There are few consumer electronics devices that have elicited delight from me like Sonos. I’m fortunate enough to have worked with the company in the past, to help test their products over the past six years. As a result, I’ve become a customer over and again Sonos powers the outdoor patio remodel we did a few years ago, our multizone home audio in the main living areas and recently the addition of a Playbar and Sonos Sub to our main family room have met with universal approval. Enter the Sonos PLAY:1. Priced similarly to Jawbone or other products, the newest and most affordable product in Sonos’ lineup is sure to bring in a whole new category of enthusiast. The PLAY:1 solves another challenge – 5.1 surround sound in the family room. The TV sits at a 45deg angle to the rest of the room, walls at odd angles with load bearing beams making it highly impractical to use in-wall or mounted rear channels. I can get power to the appropriate locations but the home-run for speaker cable would be a major undertaking. I thought that latency would be a concern but having recently tested a Sonos Playbar and Sonos Sub configuration I’m no longer concerned. The latency was negligible to me and could not be perceived by the family. 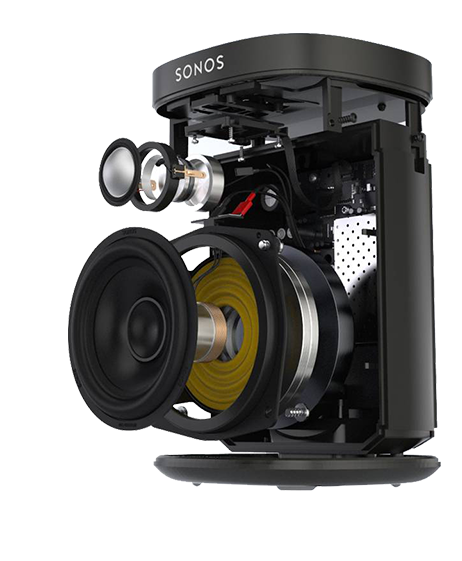 The Sonos PLAY:1 comes with two class-D amplifiers, one 3.5″ mid-woofer and one tweeter. The design is typical Sonos – high attention to detail and meticulous design. Available in white or black, the PLAY:1 is even humidity resistant so you can use it in the bathroom. Just don’t put it in the shower or tub. If you’ve been considering Sonos, I highly recommend the new Sonos PLAY:1 as an entry-level option or to round out a Sonos-based home theater system. Just in time for the holidays. Source: PLAY:1 Wireless Speakers | The Wireless HiFi System from Sonos. But are you truly getting 5.1 sound? My issue with the Playbar, for a premium device, is a distinct lack of inputs. Wish I could trade in a few of my larger Sonos speakers for the Play:1 – nicer design and probably equally suitable as the Play:3s in the bedroom, office, and kitchen. I am getting good stereo separation with the Playbar but your mileage may vary. As for inputs, I agree but there are any number of SPDIF input solutions on the market. In my case my TV routes them all without issue.